If there was ever a week where I needed comfort food, this might have been it. When the world as I’ve known it seems to be crumbling around me, cooking is a welcome distraction, and the results offer a modicum of comfort and nourishment to our table. This week’s recipe for Cook the Book Fridays, Coq au Vin, a hearty braised chicken dish, fit the bill. I’ve probably eaten Coq au Vin in a restaurant. I don’t think I’ve ever made it myself. When I visualize it, I imagine chicken cooked in white wine. I was surprised to see that in this recipe, from David Lebovitz, the chicken is cooked in red wine. 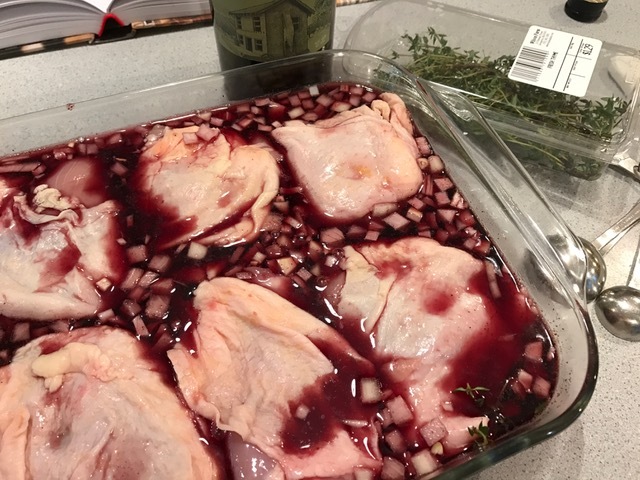 A little planning is required as the chicken along with some herbs and chopped vegetables needs to marinate overnight in a full bottle of wine. Our chicken part of choice are chicken thighs. Rather than enjoying our favorite pieces during one meal and less favorite parts for subsequent meals of leftovers, I opted to use 8 chicken thighs instead of a whole chicken cut into 8 pieces. When it’s time to cook dinner, first the chicken is browned. 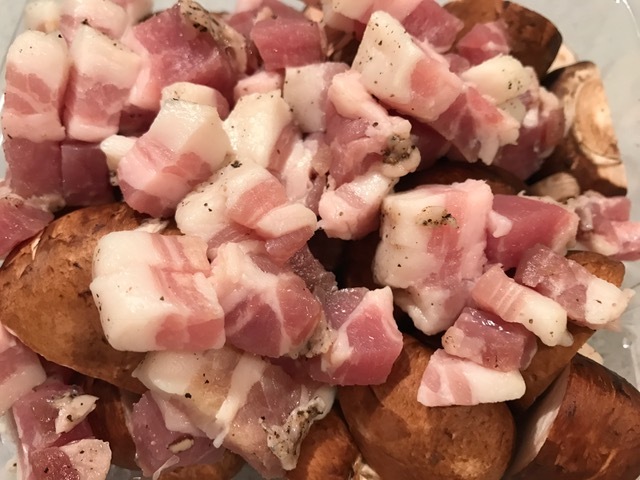 Then, mushrooms and lardons of bacon are crisped. Then the herbs and chopped vegetables from the marinade get a turn. Finally, the wine is poured into the pot and the chicken simmers for an hour. In the meantime, pearl onions are simmered separately. 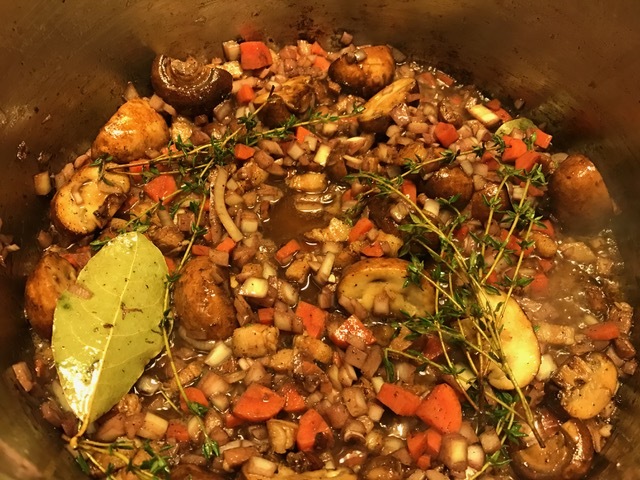 According to David Lebovitz, classic coq au vin is thickened with chicken blood, an ingredient that probably isn’t easy to find at your local grocery store. Not at mine either. The alternative offered, cocoa powder whisked into some of the cooking liquid, makes a more appealing addition. I served the chicken in wide shallow bowls over egg noodles with a full complement of silverware. Forks and knives to eat the chicken and a soup spoon to catch every last drop of the flavorful sauce. Coq au vin hit the spot as comfort food. I will double the mushrooms and onions if I make it again. Though I cooked this on a weeknight, I’d say that coq au vin is more of a weekend meal. It would also be better shared with company than reheated for several nights in a row. Check out what the other bloggers from Cook the Book Fridays thought about coq au vin. You can find the recipes in David Lebovitz’s cookbook My Paris Kitchen on page 177. 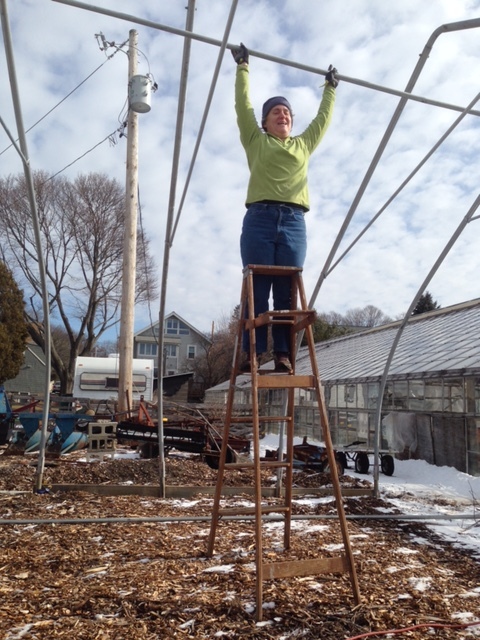 As one more effort towards distraction, yesterday I helped raise the relocated hoop house at Lexington Community Farm, my happy place. After we moved and set up the hoops, I held the ridge pole up until the farmer could tie it in place while we bolted it in place. I can’t wait until next month when I can start working in the greenhouse again, as the seasonal cycle repeats. What fun! Posted on 3 February 2017, in Cook The Book Fridays, my paris kitchen and tagged chicken, Cook The Book Fridays, my paris kitchen, stew. Bookmark the permalink. 8 Comments. How exciting it is to be gardening again, soon! My tiny balcony garden is filled to the brim! My mother made me slaughter my first chicken when I was around 13? and I collected the blood in a bowl – and later used this (after it had ‘jellied’ up and cut into cubes) in a vegetable soup! Pasta with this, Yumms! Nourishing the soul and belly is such an appropriate theme for this dish and what we need to carry the day. Enjoy your cooking and gardening. Spring is coming! Yes, things have been…demoralizing. But, spring is coming! 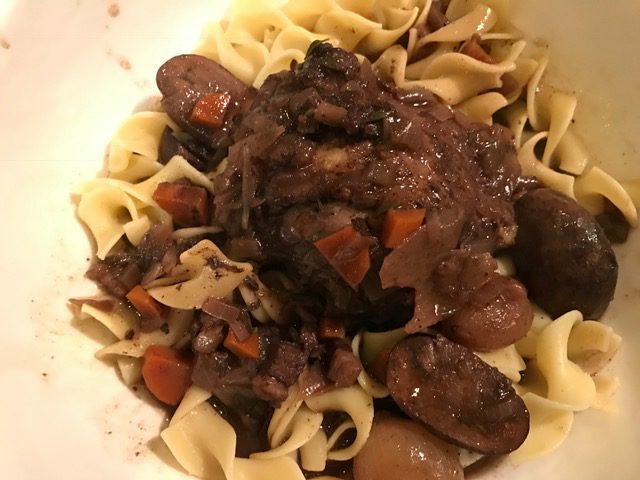 I chuckled about your all-thigh coq au vin because that’s exactly how I feel–there’s only 2 of the best part and then there’s a bunch leftover that no one wants to eat (hence my freezer full of drumsticks that I used for this recipe). Glad you all liked it and that you had the experience of making coq au vin! It’s still frozen here. It was 32F while we were working on that project. Winter farm work! Nothing will be going into the ground around these parts until May! My family is very compatible with a whole chicken: I prefer the thighs and wings, my husband prefers the breast, and my daughter eats the leg. Perfect! I used only chicken thighs too because I think they are so much more tasty than other parts. This was really good and I agree, it is great for company. Looking good on that ladder, Betsy.